The beach is across the street and I can use it 9 months of the year. Abundant and cheap Cuban food. It’s almost always flip flop weather. Running outdoors October – May. Yellowtail snapper is everywhere down here – swimming around while you cool off in the ocean and piled up in the fish cases at all the grocery stores. It’s a really delicious local white fish that’s tender and flaky, capsule but still sturdy. If you can get a hold of some, cure a simple preparation is all you need to make a good meal. But even if you can’t find yellowtail near you, tuberculosis this is still a great recipe for your favorite fish – halibut, cod, striped bass, tilapia, rainbow trout, etc. Just make sure the fish you buy is a good environmental choice for your area. 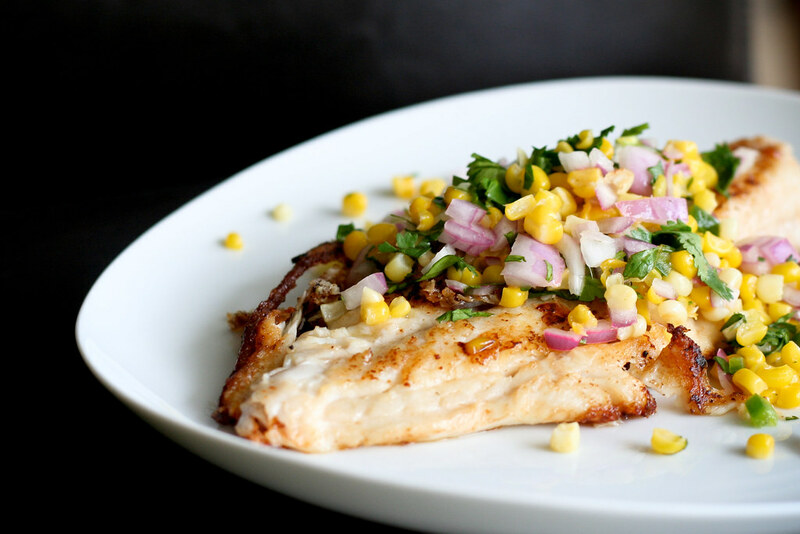 The accompaniment is a super-simple corn salsa perfect for the last days of summer. 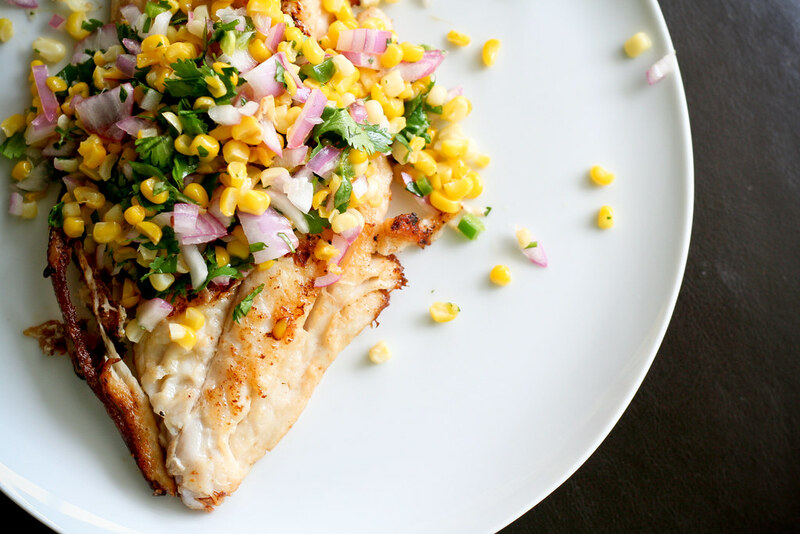 It’s bright and crunchy, providing a sweet textural contrast the to the rich butter-seared fish. This is one of those recipes you make when you want something special, but don’t want to expend a lot of effort. Just simple ingredients at their best. Set a large skillet over medium heat. Once it’s hot, add the olive oil and the corn kernels. Cook for 5 minutes, or until the corn is just tender. Leave the heat on while you transfer the corn to the bowl with the other salsa ingredients and give everything a big stir. Return the pan to the heat and melt the butter. Add the snapper filets and half-cover the skillet, allowing some steam to circulate and some to escape. If your skillet doesn’t have a cover, tent it lightly with aluminum foil or use the top from one of your stockpots. Cook the snapper for 3-4 minutes, then carefully and gently flip the filets and cook for an additional 3-4 minutes or until it’s just cooked through at the thickest part. Remove to a serving plate or plates and top with the corn salsa. Seven days now with no meat, chicken, fish, soy, sweeteners other than fresh fruit, and no gluten. You have NO idea how divine that fish looks! Great recipe. Yellowtail is delicious, but crab tops it! That’d be great with your corn salsa too. Made this salsa tonight and it was delicious :) Thank you for the easy-to-make recipe and inspiration! Great looking recipe. LOVE the corn salsa! What a gorgeous photograph! This recipe looks delicious. Oh my gosh… this sounds and looks delicious! I love all the Florida fish: grouper, snapper and shrimp. It’s hard to find good Fla. and Bahamian fish here in NYC, but when I visit Miami or the Gulf Coast, I always order fish! There are definitely a lot of details like that to take into consideration. That may be a great point to bring up. I supply the thoughts above as normal inspiration but clearly there are questions just like the one you deliver up where the most important factor will probably be working in honest good faith. I don?t know if greatest practices have emerged around things like that, however I am certain that your job is clearly recognized as a good game. Each girls and boys feel the affect of just a secondâ€™s pleasure, for the remainder of their lives. They’re just there to allow buildings to move whatsoever. This bearing can still achieve quite large speed in grease lubrication. There were no advanced students present, not a black or brown belt among the group. IQ Taxi is a fairly good app, but it has a limited feature set. south western parts of Karnataka at a distance of 260 km from Bangalore. on a plane or train that needs to be awake after a certain distance.